It’s fun, but you’ll need to be able to sit and listen to all of it. Turns out, I'm quite terrible at running away from dinosaurs. 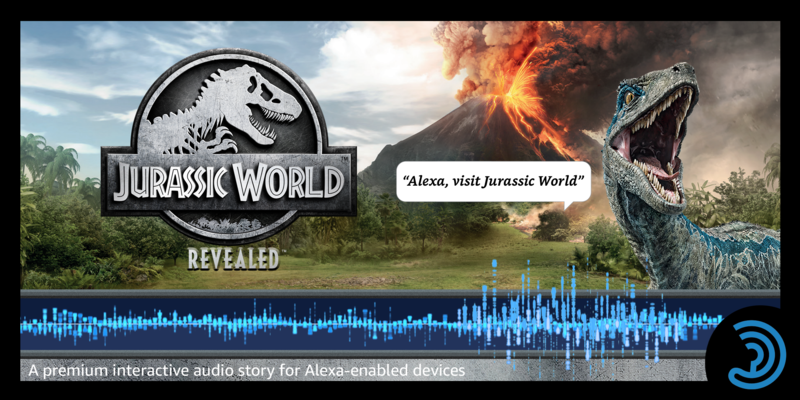 This is a thing I learned after playing all six chapters of the Jurassic World Revealed game on Alexa, which launches today in tandem with the movie. The first chapter is free, and you can get it by enabling the Jurassic World skill in your Alexa app. If you choose to embark on this "interactive audio adventure," as the creators describe it, you'll spend anywhere between five minutes and an hour with podcaster and aspiring investigative journalist Janet Best. During this time, you play her co-producer Jesse, and you will have to identify dinosaurs, spy on characters from the movie (oh hi, Chris Pratt) and make rapid decisions when confronted with life-threatening situations. I sat through the game on my Amazon Echo, but you can play it via anything that has Alexa embedded, including the app on Android and iOS phones. Frankly, the biggest challenge for me was actually sticking around for the whole game. I'm not the sort of person who sits for an hour to listen to a podcast -- with audio-only media, I often multi-task. So I let the game play in the background as I scrolled through Instagram on my couch and, later, got ready for work. Because my attention was divided, I often missed certain clues as Best narrated our adventure for an in-story podcast audience. That wouldn't be a problem if I could simply hit rewind or go back to a previous chapter, but I couldn't. When I asked Alexa to "go to previous chapter" or "go back," nothing happened, and the game would resume. Worse, when I said "Alexa, pause," it would skip ahead a chapter. It's not yet clear if this is just a bug with my beta, but still, the only way to pause the game for now is to say "Alexa, stop." Then you'll have to start the skill again by saying "Alexa, open Jurassic World" and choosing "Resume." Aside from those gameplay mechanics issues, Jurassic World Revealed is a mostly enjoyable and engaging ride. It's very well produced, and the sounds of dinosaurs roaring in the background and leaves crunching under heavy footsteps helped re-create an aural version of Isla Nublar in my living room. In my quiet apartment, it was easy to hear every little detail, but I imagine you'd need more powerful speakers to enjoy this experience in a noisier setting. Or you could fire this up on your phone and plug in earbuds. Bigger, better speakers aren't necessary for enjoying Jurassic World Revealed, though. The sound effects were clear enough on my Echo (2nd gen). A still from the first Jurassic World movie. The game opens with your arrival on the island, establishing Best as the host and co-producer of your podcast. It's set during the events of the Fallen Kingdom movie, and you learn about the ongoing efforts of the Dinosaur Protection Group (DPG) to rescue the animals left behind. Quickly, you encounter some of the prehistoric creatures. Your dino knowledge will be slightly tested as you're asked to choose between running, standing still, feeding or scaring away one of them. Fortunately for me, failure to pick the right option didn't result in death, but I sure pissed off a behemoth. I don't want to spoil the game for you, so I won't tell you which species was involved, but you'll have to know the traits of some better-known dinosaurs. As the game progresses, you'll come across other characters, like members of the DPG, as well as Chris Pratt's Owen Grady and Bryce Dallas Howard's Claire Dearing. Hearing their voices was a highlight for me, although I wish I had gotten the chance to interact with them more. I found Best slightly annoying throughout, in the same way I detest incompetent characters in other shows. But her ineptitude and clumsiness is part of what moves the plot along, so I begrudgingly accepted it. Ultimately, Best and I managed to achieve our objectives and escaped the island with our lives, having survived some close shaves with angry dinosaurs and people. Revealed isn't the first voice-based choose-your-own-adventure game for Alexa, but it highlights the limits of the medium. I doubt many people will have the patience or desire to sit through an hour of a "game" that is mostly someone talking at you. I haven't played Westworld or the other Alexa games, so I can't say if those suffer from the same issue, and there aren't numbers yet that suggest if they're all that popular. Sure, people enjoy the Telltale games, which can feel similar, but those at least have a graphic component. Still, this is a fun way for fans to pretend they're somehow involved in the Jurassic World universe, and is a decent way to kill time.